Five Americans and several other men were arrested after police discovered they were carrying a number of automatic rifles and pistols in Port-au-Prince. 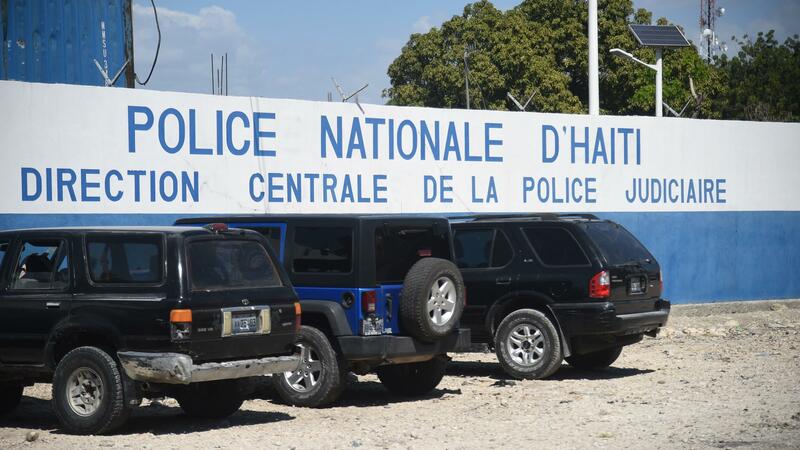 The men are being held at this Haitian National Police compound. We know their names, and where they were. But no one has given a public explanation for what several former elite U.S. service members were doing in Haiti — and why they were driving without license plates, carrying an assortment of automatic rifles, drones and other gear. The men face charges of being part of a criminal conspiracy, the Haitian Times reports, after being intercepted at a routine police roadblock. "They said that they were here on a 'government mission,' " Miami Herald reporter Jacqueline Charles told NPR from Port-au-Prince on Wednesday. "They did not specify which government, but then they did tell the police that ... their boss was going to call their boss." The implication, Charles says, is that someone high in Haiti's government would be able to free the heavily armed group — and she adds, "members of the administration of President Jovenel Moise did try to get these gentlemen released from police custody — but that did not work." Haitian police arrested the five Americans on Sunday afternoon, along with a Haitian man and two Serbians. They were driving two vehicles that were stopped at a police checkpoint near Haiti's central bank in the capital, according to the Miami Herald. "Inside their vehicles: six automatic rifles, six pistols, two professional drones and three satellite phones," the newspaper says, citing the police. They were also carrying sets of license plates. The men were driving a Toyota Prado and Ford pickup that have since been traced to people close to President Moise — who faces calls to resign over accusations of corruption and mismanagement. The five Americans have been identified as Christopher Michael Osman, Kent Leland Kroeker, Christopher Mark McKinley, Dustin Porte and Talon Ray Burton. At least two of them are former Navy SEALs; another two also served in the U.S. military, and the fifth man has worked as a contractor with the Department of Homeland Security, the Herald reports. A U.S. State Department official says the agency is aware the Haitian National Police arrested U.S. citizens and that when Americans are arrested overseas, it seeks consular access "as soon as possible." Citing privacy concerns, the official referred any further inquiries to the Haitian police. News of the arrests came as antigovernment street protests have been relatively quiet. That's in contrast to last week, when deadly violence prompted the State Department to issue a "do not travel" advisory and order all nonemergency U.S. personnel and their family members to leave Haiti. 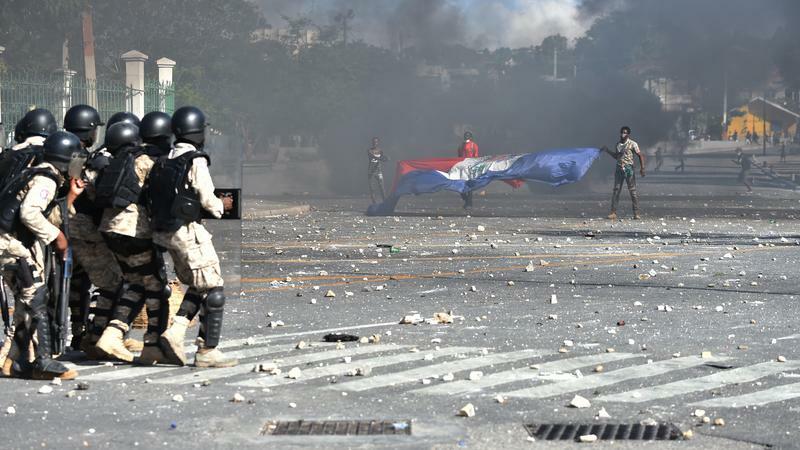 As NPR reported last week, anticorruption protests grew very intense as fury grew over a court report that alleges Haiti's government diverted or misused billions of dollars in development money from Venezuela's Petrocaribe fund. The accusations include Moise and a company he headed before he took office in 2017. At least seven people have died in the unrest. The arrest of the heavily armed men has triggered wide speculation about why they were in Haiti, particularly among Moise's political foes. The possible explanations range from a desire to protect the central bank or foreign assets to potential attacks on antigovernment demonstrators and leaders. Earlier this week, National Police spokesman Michel-Ange Louis-Jeune said in an interview with Voice of America that the men had "a lot of ammunition" and weapons that they were not authorized to carry through Haiti's streets. Noting the ongoing investigation, he said, "we will see if there are other people involved in this case who can tell the police what they were planning and what they were going to do." In the end, he pledged, the police "will be able to explain to the public what they've found and shed light on this case"
NPR's Stacey Samuel contributed to this report. "Do not travel to Haiti due to crime and civil unrest," the U.S. State Department says, urging Americans to avoid the country that is wracked with violent protests against President Jovenel Moise. The State Department is pulling all nonemergency U.S. personnel and their family members from the country. Haiti’s man in Washington, an ambassador with seven years under his belt defending his country’s image, has been recalled.